My kids have decided that they will no longer nap at the same time during the day. My hour or two of midday quiet is gone. I won’t lie – I was pretty upset at first. I relied on that hour or two. But they’re both still damn cute, and I roll with the punches. So yesterday morning, while T had his long morning sleep, W and I holed ourselves up in the kitchen. She helped me slice and roast and grill and photograph and then we sat on the floor and ate. W had avocado on toast and slices of grilled apple. I had goat’s cheese on fresh rye bread and great delicious big forkfuls of this salad. I didn’t intend to cook something new for the blog this weekend just past. I have a backlog of photos to edit of fantastic recipes to share with you all. 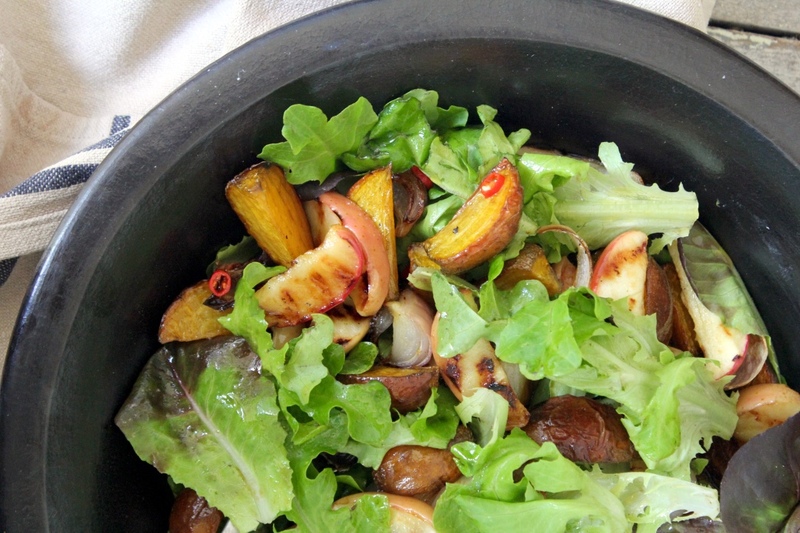 But then I saw this perfect bunch of golden beetroot at the market on Saturday morning, so my plans changed and I threw together this Golden Beetroot, Shallot & Grilled Apple Salad. And let me tell you, this salad is lovely. 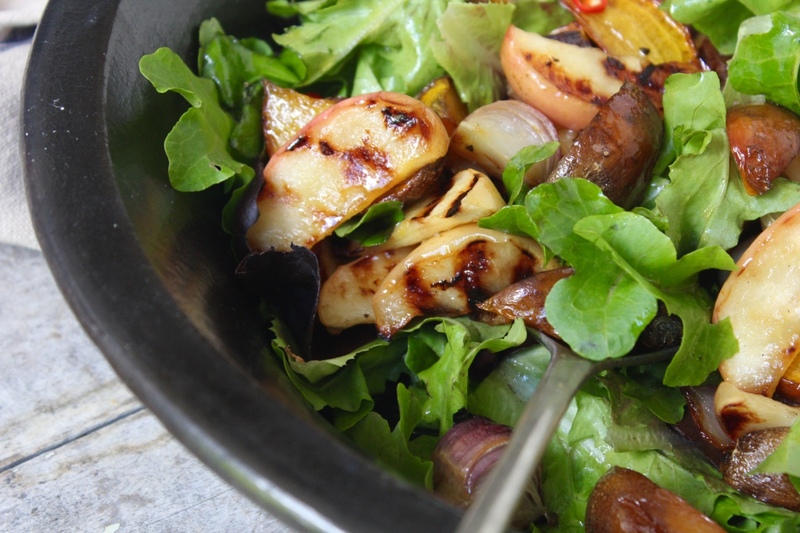 The roasted vegetables and grilled apple bring notes of caramelisation, sticky earthy sweetness contrasted beautifully with crisp green lettuce, the zing-y spicy dressing. 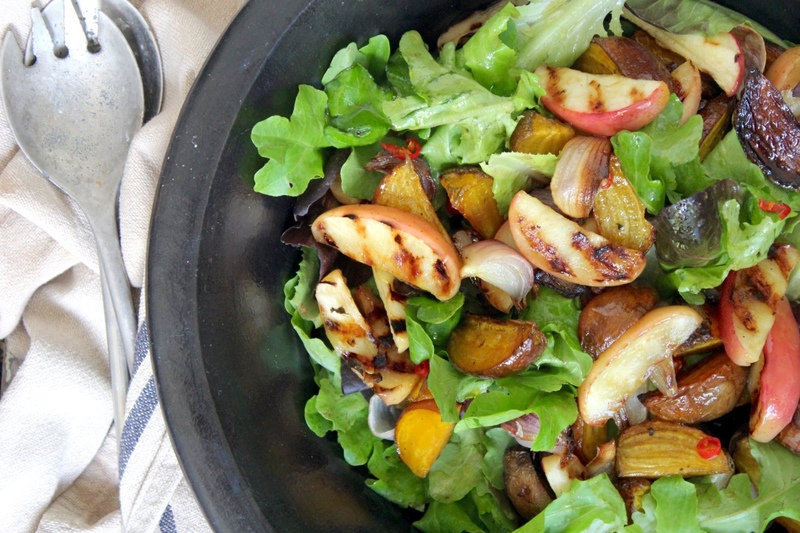 Choose apples that err on the side of tart for this salad, as the grilling will draw out their natural sweetness. P.S. Let’s be friends! You can find me on instagram (food + flowers + art + the odd kid pic), twitter (food + feminism + stuff), and pinterest (food + books + pretty things). In a small jar combine the orange juice, vinegar and oil. Finely slice the chilli and add to the jar along with salt & pepper, to taste. Shake to combine, and set aside. Pre-heat oven to 200° celsius/400° fahrenheit. Top and tail the beetroot, and slice into wedges. 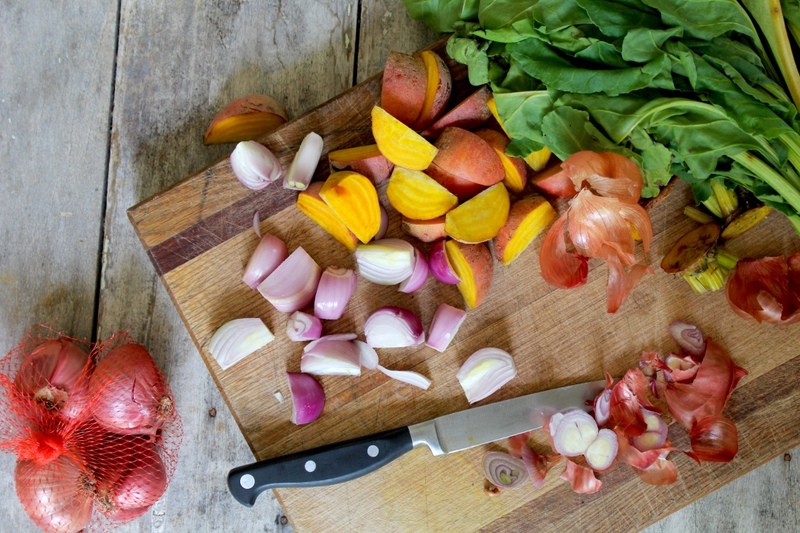 Peel the shallots and, depending on their size, halve or quarter. Transfer to an oiled baking dish in a single layer and bake for approx. 35 minutes, or until the vegetables are deeply browned. Halve the apples, remove the cores, and cut into slices. Brush both sides of each slice with olive oil. Heat a grill to medium-high heat and lay the apple slices in a single layer, cooking for about 5 mins. or until browned, then flipping and cooking for another 3 – 5 mins. on the other side. Remove the lettuce leaves from the core, wash and dry. 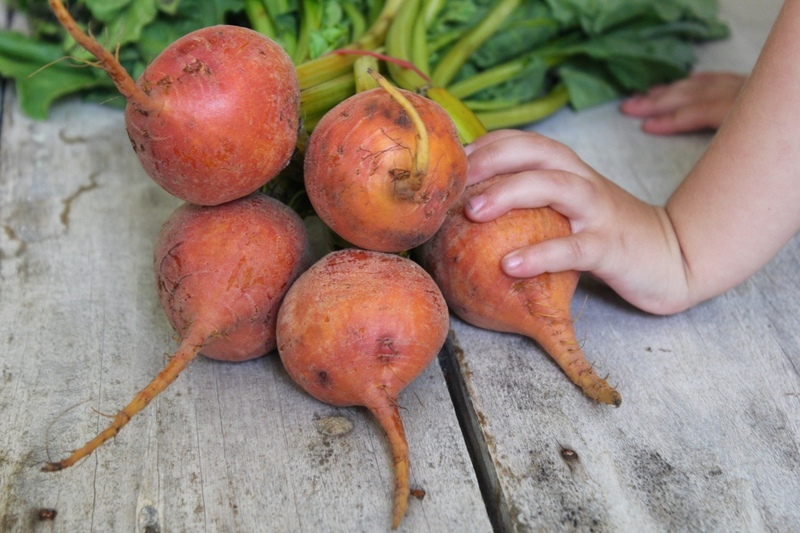 In a large bowl, combine the lettuce with the beetroot, shallots and apple. Pour half the dressing over the top and toss to combine. Have a taste, and if you would like a little more zing add the rest of the dressing. This is a time of the year when our seasonal produce overlap a little, which I like. 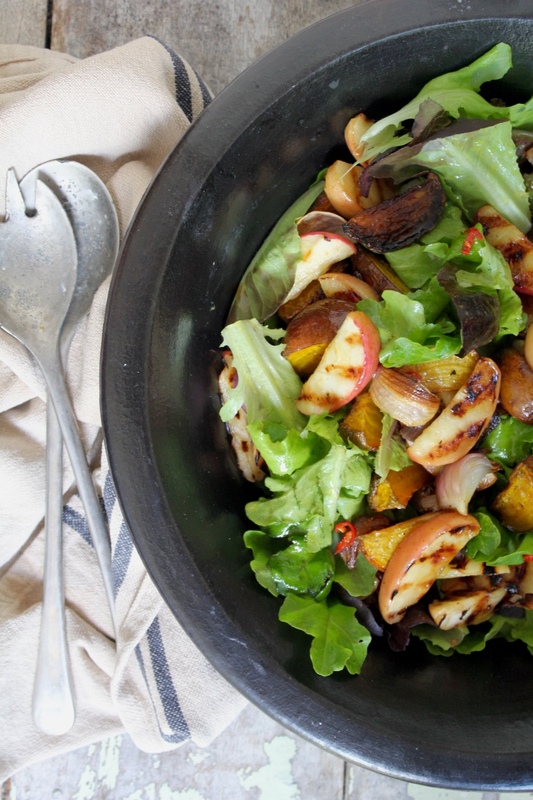 The orange juice in this dressing sounds delicious with the roasted vegetables. 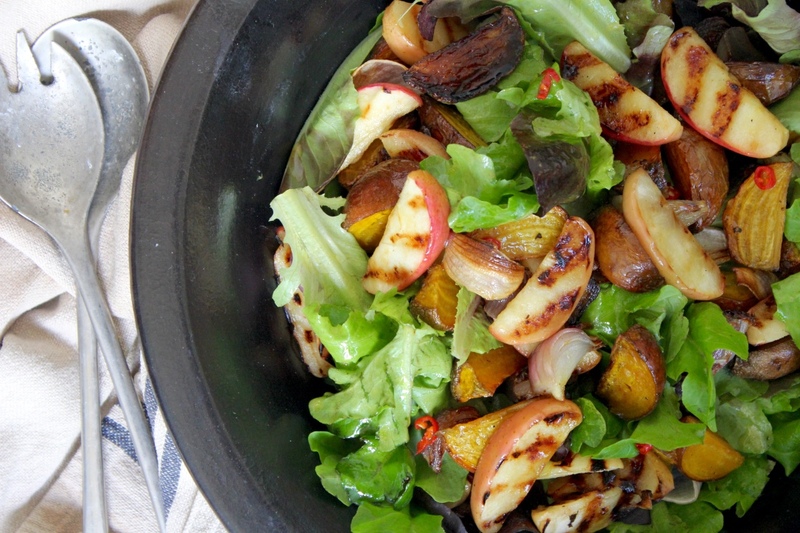 I love the combo of sweet & spicy, which this salad dressing had plenty of. In fact, I had some leftover so added a splash of tamari and used it as a marinade for some tofu last night. Worked out beautifully. Hope you’re well Katie! Thanks Elaine! I think peaches or nectarines would be equally delicious in place of the apples, depending on what’s in season.